I am walking down a canyon in Northern Arizona. The morning light is high up on the canyon wall, the bottom of the canyon still in the shade. The air is cool. The sand under my feet gives way at every step, making walking challenging. I am immersed in the admiration of stone and light, enthralled by the patterns that shadows cast onto the canyon walls. The blue sky over me creates a mesmerizing blue-orange complementary color palette. I pull out my camera, a Fuji X100s, a small lightweight camera ideal for a leisurely hike. As I prepare to take my first exposure the red battery warning light comes on in the viewfinder then the camera shuts off. Dead battery. I checked it at the car and it showed full so I did not take any spares. Not to be defeated I pull out my iPod touch, the only other ‘camera’ I have with me. It’s either that or not taking photographs. However, this is not an option; the light and the location are just too good to pass up. I sometimes find a subject that inspires me by photographing whatever catches my attention. 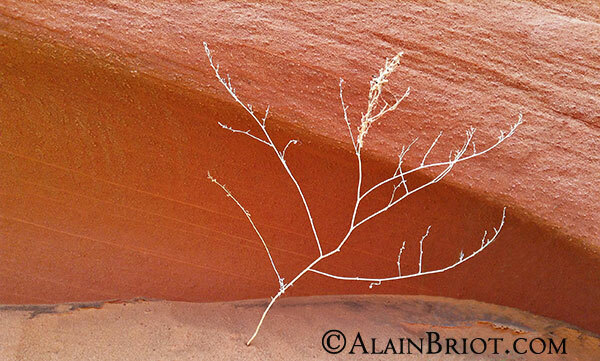 That morning it was when photographing the play of light and shade on the canyon walls that I noticed a delicate, dried out plant that grew under a miniature alcove on the canyon floor. It was tiny, being only a couple feet high, and it wasn’t about light and shade, but it made me want to photograph it. The scene was less than perfect and it was not as simple as it appears in the final version. I had work to do. Interestingly I did not see it that way in the field. I suppose I worked fast and did not think the image through the way I would have with a larger camera. I often feel over-confident when using a small camera. In the field, standing in front of the scene depicted here, I liked what I saw. It was about enjoying the moment, capturing it and bringing back a record of what I had seen. In fact, the concept of simplicity did not come to my mind at all. 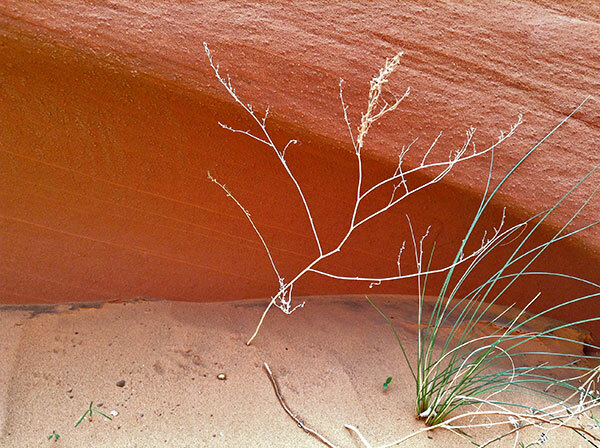 What I saw was more about the play of shapes along the sandstone wall than about an image devoid of distractions. The unnecessary visual elements present in the scene did not bother me. I suppose if they had bothered me I would have removed them, or at least attempted to. It was only once back in my studio that the image revealed itself as being about simplicity and not just about lines along a canyon wall. The lines of the little plant were not enough to generate interest because they competed with the lines of the green plant and the lines of the debris on the sandy bottom. These had to go. If the image was to work it had to be simplified to the extreme. I went to work using the content aware healing tool in Photoshop. I continued by cloning the visually offensive elements until nothing was left except the little white plant. In doing so I perfected the image until it became aesthetically pleasing. The outcome is above. 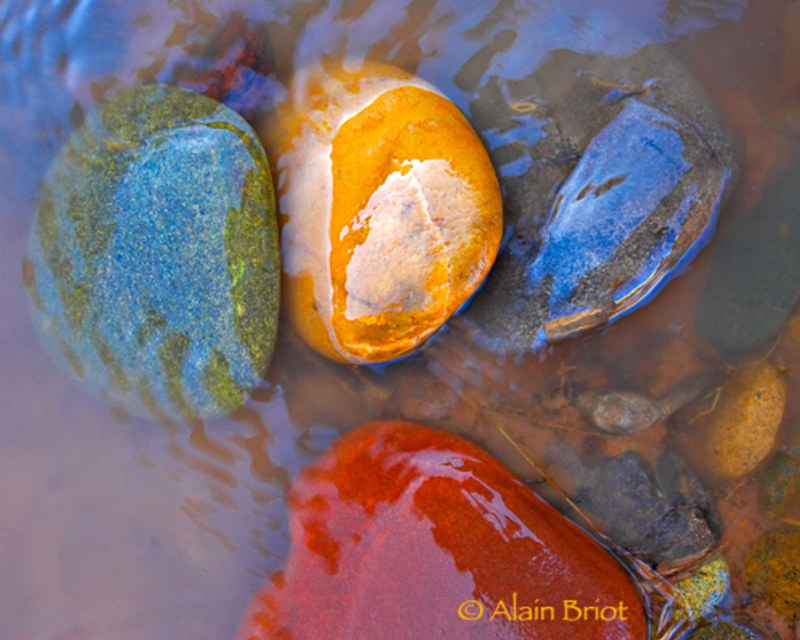 It is an image about simplicity, a simplicity that exists only in the image and that may never be found in nature. And yet it is nature that gave birth to this simplicity, to my inspiration and to this final image. Nature provided the raw material. I revealed what was in the image by removing all that distracted from seeing it. In doing so I had to let go of concerns for removing much of what was captured by the camera. As I worked I kept thinking about these images showed in software ads where bathers surround the main figure in the image until they are all ‘magically’ removed by software processing until only the person of interest is left in the photograph. If it can be done with people on the beach it can be done with plants in a canyon. 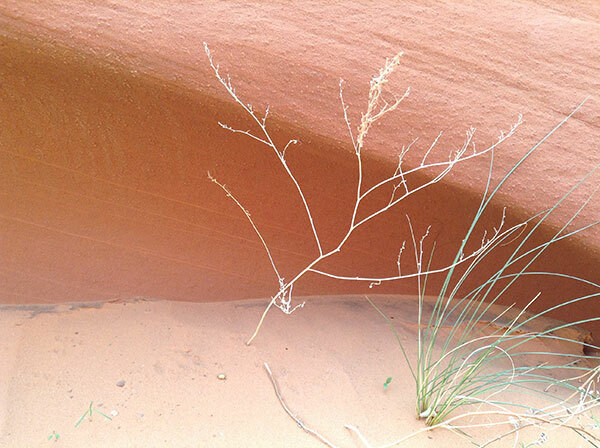 If it can be done to show your relatives and not everyone else on the beach it can be done to show just that little white plant and not all the other plants and debris in the canyon. Obviously, this is a low-resolution image. However, I don’t see that as a problem. I can make a small print, a 5×7 for example. In terms of sales 5×7 prints are the best selling size. I sold tens of thousands of them over the years. Small prints have a beauty of their own. They are little jewels that derive their interest from the content of the image rather than from the size of the print. They are versatile because they do not require a large space to be displayed. They can become part of a folio or of a collection of small photographs. Or they can be framed in a 16×20 mat and acquire added importance because isolating the image calls for the viewer’s attention. Not every successful photograph needs to be taken with a 100-megapixel camera. Small cameras are just as effective if you plan to make small prints. In fact, I found that when I use a small camera I feel freer to make changes to the image capture. I don’t feel as guilty for taking out things when they have a low resolution than when they have a high level of detail and this gives me more flexibility and freedom in making changes to the image. Perhaps the low resolution makes it easier for me to let go of concerns such as removing elements or taking out unnecessary details. Simplicity is based on the art concept that ‘less is more’ and that whatever does not add something to the image removes interest in the image. All the elements of the composition must play a role. If something is there for no reason other than being in the original scene it becomes a distracting element that conflicts with the purpose of the image. This image is about implementing the concept of simplicity in the image rather than finding the perfect example of simplicity in nature. Nature offers simplicity in its own way but in this instance it was imperfect. I went in and made it my vision of simplicity, one that called for being as close to perfection as I could make it which in this case meant removing anything that was unnecessary, anything that added complexity or clutter to the image. I could have removed the green grass in the field by pulling it and I could have cleaned up the twigs and removed the small unwanted rocks before taking the photo but honestly, I did not think of it. When working in the field I did not see these as being objectionable. Only once in my studio, looking at the image on the monitor did it become clear to me that they had to go. 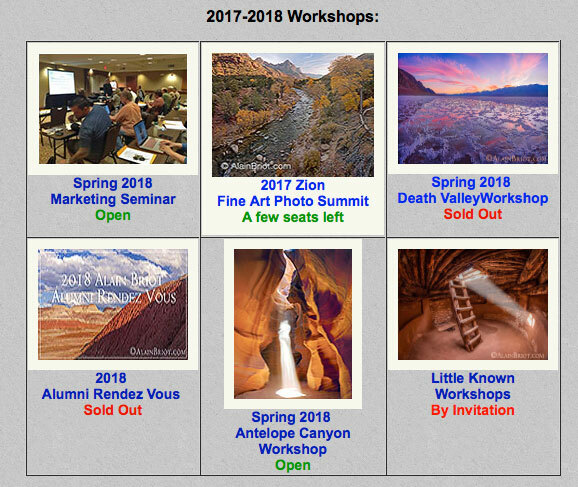 I removed these elements in Photoshop using content aware and regular cloning. In doing so I saved a plant because if I had pulled the green grass in the field it would have died for a photo while that way it is still alive. Even if eaten by a Navajo sheep it served its purpose better than if it had been pulled to simplify a photograph! 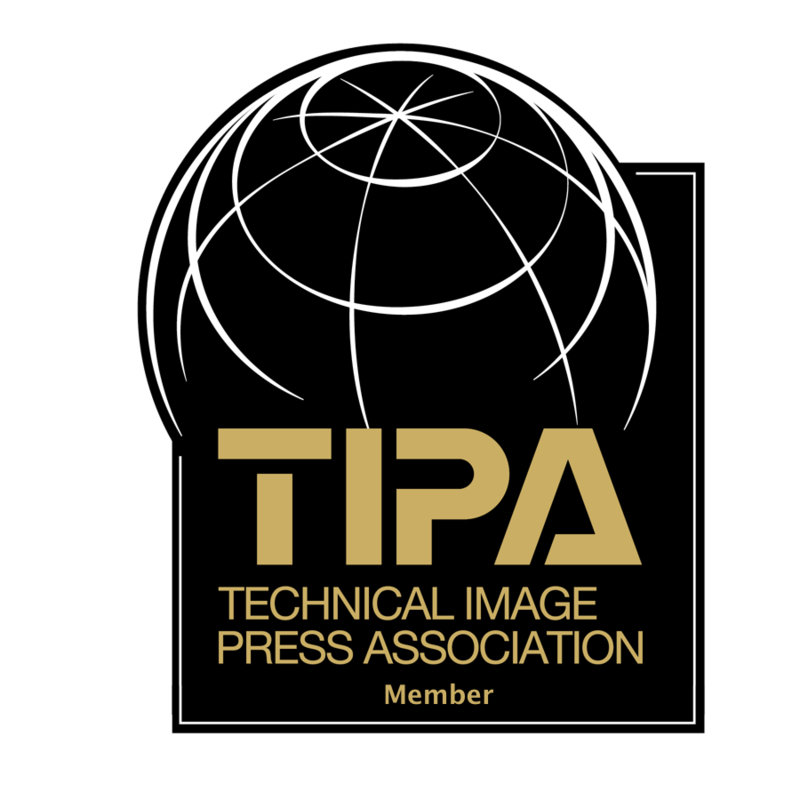 The purists will object and so will those who reject digital processing and call it manipulation. But there is no deception here. The means used to create this image are fully revealed. This is one of the goals of this essay. Those who love art will not let these means bother them because they know that art is manipulation and artifice, that it is unconcerned with reality, using it only as the source material and not as the end product. This series is a suivre, meaning ‘to be continued’ in French. In the next two essays, we will look at High Key and Low Key images, two other means of turning photographs into art.